Not to be confused with Commando System (South Africa) or Kommandokorps. The Boer commandos or "Kommandos" were volunteer military units of guerilla militia organized by the Boer people of South Africa. The term came into English usage during the Second Boer War of 1899-1902. In 1658, war erupted between the Dutch settlers at Cape Colony and the Khoi-khoi. In order to protect the settlement, all able bodied men were conscripted. After the conclusion of this war, all men in the colony were liable for military service and were expected to be ready on short notice. By 1700, the size of the colony had increased immensely and it was divided into districts. The small military garrison stationed at the Castle de Goede Hoop couldn't be counted on to react swiftly in the border districts, therefore the commando system was expanded and formalized. Each district had a Kommandant who was charged with calling up all burghers in times of need. In 1795, with the First British Occupation and again in 1806 with the Second British Occupation, the commandos were called up to defend the Cape Colony. At the Battle of Blaauwberg (6 January 1806), the Swellendam Commando held the British off long enough for the rest of the Batavian army to retreat to safety. Under British rule, the Cape Colony continued to use the commando system in its frontier wars, in addition to regular British imperial troops. Boer commandos fought alongside Fengu, British settlers, Khoi-khoi and other ethnic groups in units which were often mixed. Light, mobile commandos were undeniably better-suited than the slow-moving columns of imperial troops, for warfare in the rough frontier mountains. However, tensions often arose in the Cape's government over the relative merits and control of these two parallel military systems. During the Great Trek, this system was used and remained in use in the Boer republics. Both republics issued commando laws, making commando service mandatory in times of need for all male citizens between the ages of 16 and 60. 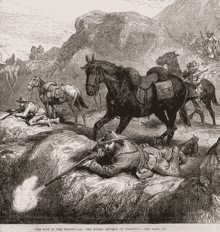 During the Anglo-Boer War (1899–1902) the Boer commando formed the backbone of the Boer forces. After the declaration of peace in 1902, the commandos were disbanded. They did reform themselves in clandestine "shooting clubs". In 1912, the commandos were reformed as an Active Citizen Force in the Union Defence Force. This system was in operation until 2005, when all commandos were disbanded again. The veldkornet was responsible not only for calling up the burghers, but also for policing his ward, collecting taxes, issuing firearms and other materiel in times of war. Theoretically, a ward was divided into corporalships. A corporalship was usually made up of about 20 burghers. Sometimes entire families (fathers, sons, uncles, cousins) filled a corporalship. The veldkornet was responsible to the kommandant, who in turn was responsible to a general. In theory, a general was responsible for four commandos. He in turn was responsible to the commander-in-chief of the republic. In the Transvaal, the C-in-C was called the Commandant-General and in the Free State the Hoofdkommandant (Chief Commandant). The C-in-C was responsible to the president. Other auxiliary ranks were created in war time, such as vleiskorporaal ("meat corporal"), responsible for issuing rations. The commando was made up of volunteers, all officers were appointed by the members of the commando, and not by the government. This gave a chance for some commanders to appear, such as General Koos de la Rey and General C. R. de Wet, but also had the disadvantage of sometimes putting inept commanders in charge. Discipline was also a problem, as there was no real way of enforcing it. The various Boer republics did not all have the same command structure. Before the Boer War, the two Boer republics had permanent artillery units (e.g. the Transvaalse Staatsartillerie), equipped with Krupp or Creusot artillery. From the early days, the commandos were issued with firearms by the government of the day. [dubious – discuss] The burghers were obliged to keep these firearms serviceable and ready at all times. Wikimedia Commons has media related to Boer military personnel of the Second Boer War. ^ RD staff (1996). Xhosa Wars. Reader's Digest Family Encyclopedia of World History. The Reader's Digest Association. ^ Hall, Darrell (1999). The Hall Handbook of the Anglo-Boer War, 1899-1902. Pietermaritzburg: University of Natal Press. pp. 13–17. ISBN 9780869809495.